Vacationing on Fort Myers Beach Florida and trying to decide which tempting option to start your day can be tough with so many delectable possibilities. These are the top five that we all agree on. 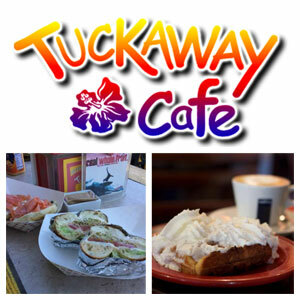 Tuckaway Café serves amazing authentic Belgian wafels (yep, that's how they spell it), bagel sandwiches, fruit smoothies and delicious coffee specialties made with locally roasted beans. The adorable pet friendly café even offers free WiFi. The menu is small and not overwhelming but you will want to try it all. The wafels are positively yummy, even without a topping! The “Tasha’s Secret” is loaded with lean turkey, avocado, bacon, provolone and cream cheese while the vegetarian “Greenpeace” is both hearty and positively packed with flavor. Meat lovers should be sure to try the “Quentin” which is filled with both tender roast beef and pastrami! The “tucked away” atmosphere is beachy and tropical in an all new location at 2301 Estero Blvd. Tuckaway now offers a beer and wine happy hour from 3PM-6PM. Stop in and visit Tre and Amy...you won't be disappointed. Mom’s located at 2450 Estero Blvd., between Mango and Chapel Street, serves breakfast and lunch on Mondays from 8am until noon and Wednesday through Sunday from 8am until 2pm. Everything is scratch made, farm to table and delicious! Mom is master of the “original” cinnamon roll and takes pride in all of her creations. You never know what specials she might prepare so stop often so you don’t miss out! You can always call 239-209-0707 and ask Mom herself what she has created today. Reese’s Restaurant is located at Key Estero Shopping Center on Caroline Street, Fort Myers Beach. An island fixture for many years, locals will attest this is a breakfast must! Trip Advisor reviewers will testify to the quality and service guests have come to expect and enjoy at Reese’s. 88% of TripAdvisor reviewers can’t be wrong! The plate sized waffles are positively melt in your mouth. The taste, quality, consistency and service are echoed time and again by first time visitors and regulars alike. The “kitchy” atmosphere is country cow shabby chic. One breakfast might make you want to moooo’ve here! The Sunflower has been welcoming guests for over 2 decades, this is where the locals go. They have breakfast down to a science! The service is FAST, and the food homemade, fresh, hot and delicious. Traditional waffles, pancakes and crepes are wonderful however the skillet breakfasts cover all the food groups. The chef’s skillet is a hearty, popular choice but you can’t go wrong with anything you select. Don’t let the packed parking lot scare you away, there are lots of tables and a friendly, efficient staff with seldom a wait. They not only do breakfast, but also serve a pretty mean Lunch and Dinner, too. This adorable little cottage, with a Key West flair, is a popular breakfast spot on the beach. The tantalizing aromas of cinnamon and all types of baked goodness lure visitors in. Though inside seating is limited, there are outdoor tables and many times a guitar player singing oldies and beachy tunes that further enhance the fun laid back Key West personality. Tempting sweet breakfast treats, biscuit sandwiches or biscuits and gravy, like grandma used to make, have made Heavenly Biscuit a must visit for Fort Myers Beach visitors and locals alike. Open 6 days a week from 7:30AM unil 1PM (closed Mondays) Heavenly Biscuit is irresistible. Whether you're starting your vacation in Fort Myers Beach or just getting away from Key West for a few days, these should satisfy morning hunger pangs. Click below for more great things to do, see, stay or eat, while in the area!